I don’t know about you, but when I listen to the lyrics of Where Do You Go to My Lovely, I think of a certain French singer of the sixties, especially after I learned that she too studied German language studies at the Sorbonne. A beautiful looking woman, as described in the song, with a sweet voice to match. 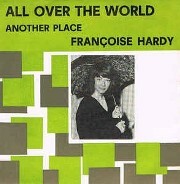 That singer is Francoise Hardy. Her upbringing was quite a different story. Her father left when she was very young and her mother, who worked as an accountant’s assistant, had to bring up Francoise and her 18-month younger sister Michele, on her own which was challenging. Their father initially only visited his daughters a couple of times a year at their home is Paris but soon didn’t bother at all, nor did he contribute financially either. Having said all that, ironically, it was a gift of a guitar from her father that sparked her interest in music. She had heard the Everly Brothers and Elvis on the radio and decided to give up her studies to concentrate on singing and songwriting at the Petit Conservatoire de la chanson, a French-speaking radio and television program which had been devised and presented like a singing class. She became passionate about music and expanded her mind by listening to Georges Guétary’s operettas as well as learning about composers like Charles Trenet and Cora Vaucaire. In school holidays her mother often sent her to Austria to improve and perfect her German which she did but also spent hours listening to music by her favourite composers as well as writing her own songs. Françoise soon began to appear on the cover of various well-known magazines and one day, whilst working on a photo shoot for the magazine Salut les Copains, she fell in love with the photographer Jean-Marie Perier, who transformed her from a shy young lady into a confident young showgirl. They had a five-year relationship but never married. Her good looks led her into the film industry where, in 1965, she had a minor role as an assistant to the Mayor in What’s New Pussycat and the following year appeared as a girlfriend of a racing driver in Grand Prix. “From the moment I went to England, I had more confidence,” she said in an interview. “In France, the image I had was of a shy girl – a poor lonely girl and not too good-looking. When I went to England I had another image. I felt the journalists were much more interested in my looks than in my songs.” She rubbed shoulders with stars like Alan Price and Georgie Fame as well as the Beatles – although it was George Harrison she got on best with as they were similar, but the person who made the biggest impression on her was Mick Jagger. Although they dined together and the press lapped it up, nothing happened as they were both in relationships. She said of him, “I was like a shy fan, you know. In 1981 she finally married her long-term partner Jacques Dutronc, a singer/songwriter and guitarist who also recorded the original version of Mungo Jerry’s hit Alright, Alright, Alright under its original title Et Moi, Et Moi, Et Moi in 1966 which was released on the Vogue record label – the same label who first signed Hardy. The couple had one son called Thomas who is now an established jazz guitarist. Hardy, for many years, claimed she was never going to sing after the age of 50. In 1988, at the age of 44, she started preparing her farewell album which was called Décalage, but fans were disappointed as she didn’t seem to go out with a big bang. Maybe she had other plans? As it turned out six years passed until we really anything from her – in 1994 she collaborated with Blur for their re-recorded version of To The End of which she sang some verses in French and it was retitled To The End (La Comedie), the following year she lent her voice to a Malcolm McLaren single called Revenge of the Flowers. Then, in 2000, she made bigger comeback with a new album called Clair-Obscur which featured her son on guitar and a duet with her husband whom she’d not collaborated with – musically – since 1978. It received rave reviews with Hardy’s voice and the arrangements being highly praised. There’s another string to Hardy’s bow, her other passion is astrology and in the 1970s she began studying it seriously and thus became an expert on astrological birth charts even writing two books on the subject. She is still legally married to Jacques but they choose to live apart spending the majority of her time in her Paris apartment and him in their other home on the island of Corsica. She continues to record and in 2012 signed a two-album deal with EMI the first of which was called L’Amour Fou. We’re still waiting for the second.